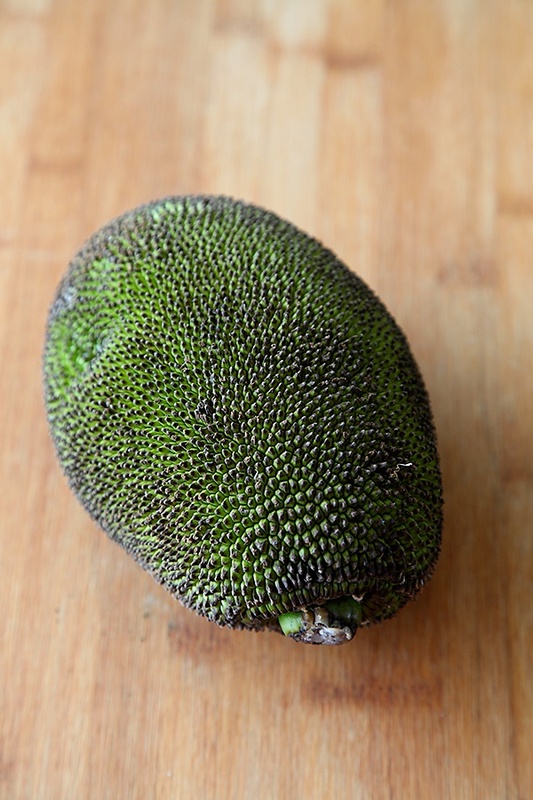 When I ventured into my kitchen with a small raw jackfruit in hand, little did I know that this precious edible beauty would be transformed into a culinary delight giving utmost pleasure to the palates of those who were fortunate enough to savour it. Jackfruit, both ripe and raw happens to be one of my most favourite ingredients to cook with. Sweet preparations made with the ripe jackfruit are heavenly as they are perfumed with the most exquisite aroma. And the meaty texture of the raw jackfruit lends itself well to rice preparations and curries. Infact the unripe jackfruit is remarkably similar to meat, making it an excellent substitute for vegetarian meat preparations. It helps to oil your hands before working with the jackfruit to prevent the sticky milk oozing out of the fruit from sticking to your hands. And then all you need to do is scrape the skin off, cut into quarters, slice off the centre (the centre portion of the fruit is discarded) and then cut into cubes. The raw jackfruit absorbs the flavours from all the spices and develops a meaty, succulent and delectable taste and texture. Nature has also bestowed the jackfruit with nutrient dense properties, making this curry score brownie points on the health factor! So, this happens to be a boon for vegetarians or vegans minus the attributes that come with eating meat. Spices are the backbone of a curry and I�™m always amazed at how different spices and their unique pairings give spectacular results! I used a combination of whole spices like coriander seeds, black cumin seeds, dry red chilies, peppercorns, cloves, cinnamon and nutmeg to make this curry. When whole spices are roasted and ground their flavour is unmatchable. Each spice imparts its distinctive characteristic into the dish. Apart from flavour and aroma, spices are also imbued with medicinal properties and this is the added bonus of eating a curry! The advantage of a homemade curry is that you get a first hand experience of the magical mystery of how spices transform a dish. And the second aspect is the freshness quotient. And the main aspect is the satisfaction that you experience in making, eating and feeding the curry, something that I would never trade for anything in this world. I can safely declare that this curry happens to be one of the tastiest dishes to emerge from my kitchen. 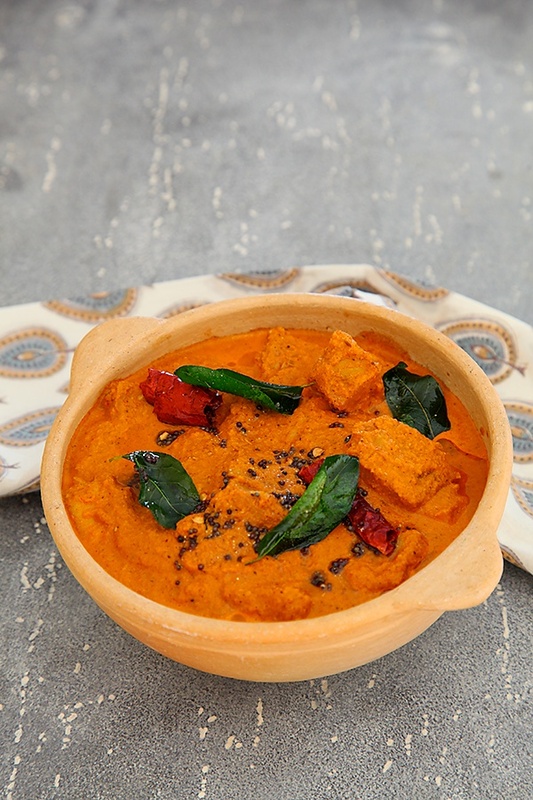 You can serve this mouthwatering curry with plain rice, Indian breads or even a simple pulao. This curry can be part of a simple homecooked menu or an elaborate party menu. Irrespective of the occasion or the other accompaniments, this curry will grab all the attention and will never fail to satisfy! If you can't lay your hands on jackfruit, then substitute it with any vegetable of your choice. The curry base will make it delightful! Prepare the tomato puree- Boil the tomatoes in plenty of water and cook until the skin starts to peel. 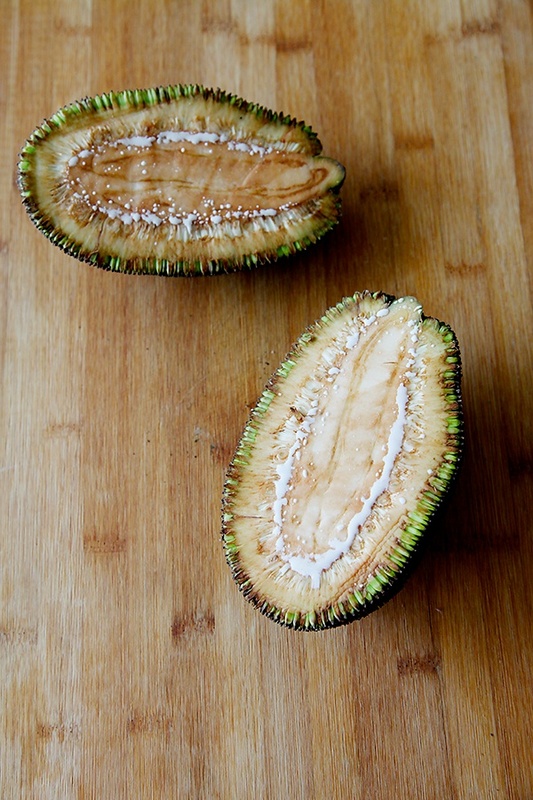 Allow to cool, peel the skin and grin to a puree without any water. Put in the cut jackfruit in a cooking pot. Pour water all over it until the jackfruit is covered with water. Add 1 tsp salt and ¼ tsp turmeric powder. Turn the heat to medium and cook until the jackfruit is fork tender or until a fork or knife pierced through the jackfruit runs through easily. 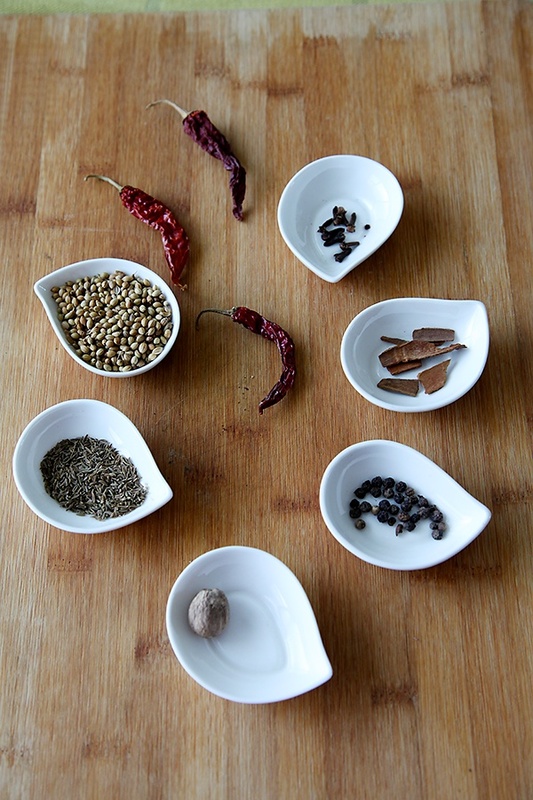 To prepare the spices paste, heat the oil in a wok and put in all the spices exceot the nutmeg powder, the coriander seeds, black cumin seeds, dry red chilies, peppercorns, cloves and cinnamon. Roast the spices until they turn aromatic, about 3 to 4 minutes. Then stir in the nutmeg powder and the coconut and roast for 3 to 4 minutes more. Mix in the remaining ¼ tsp turmeric powder. Allow to cool down a bit. 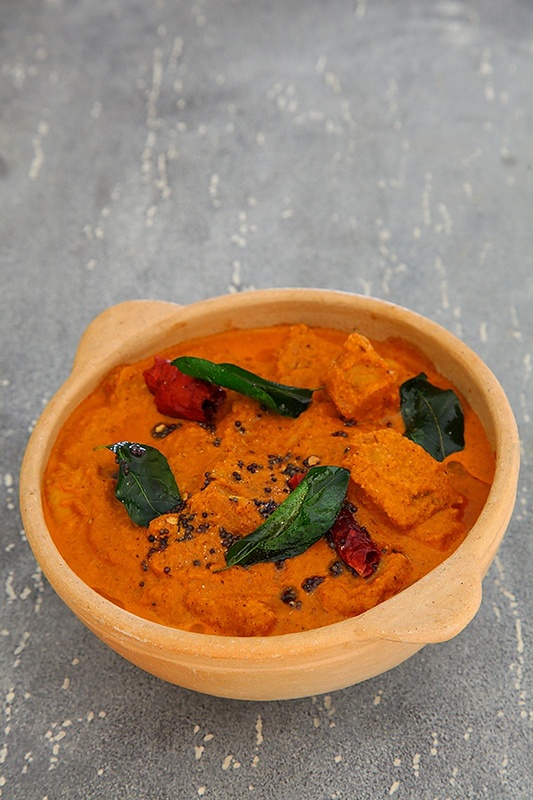 In a blender, put in all the roasted spices and the tomato puree and blend to a fine paste without using any water. Use about ¼ cup to ½ cup water if required. In a wok or pot combine the ground spice paste with the jackfruit and mix well. Stir in 1 ½ tsp salt. Add water to the required consistency and cook on medium low heat until the curry begins to boil. In a seasoning pot or a small wok, heat the oil and put in the mustard seeds. 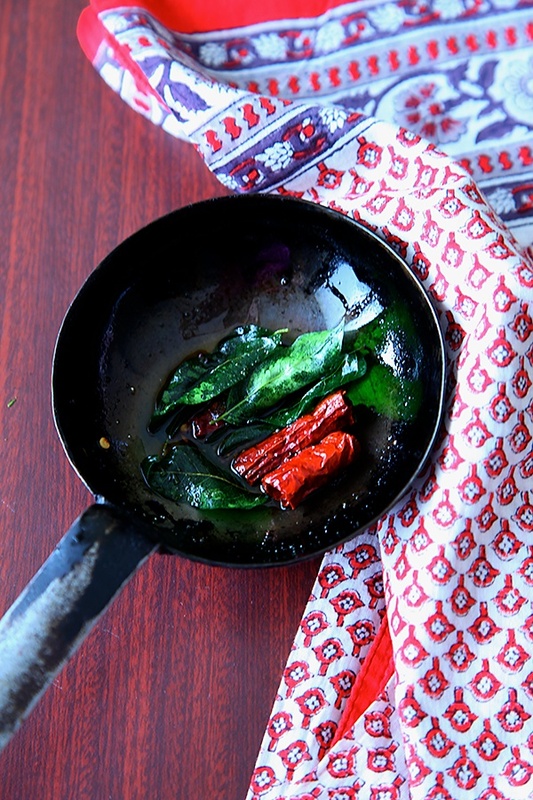 When the mustard seeds splutter, put in the dry red chilies, curry leaves and asafetida and turn off the heat. Pour the hot seasoning into the boiling curry and mix well. Turn off the heat. 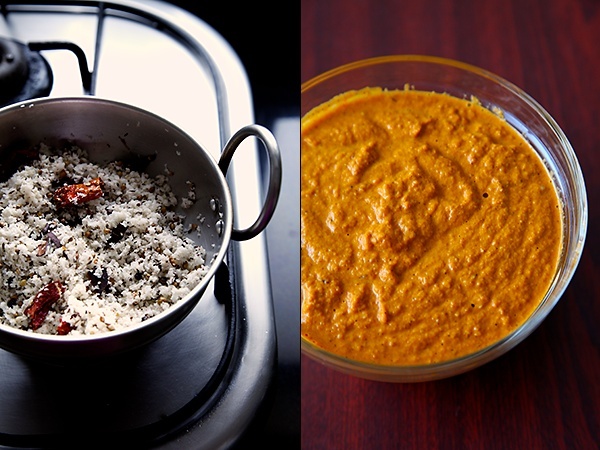 Serve hot or warm with rice, rice preparations or Indian breads. 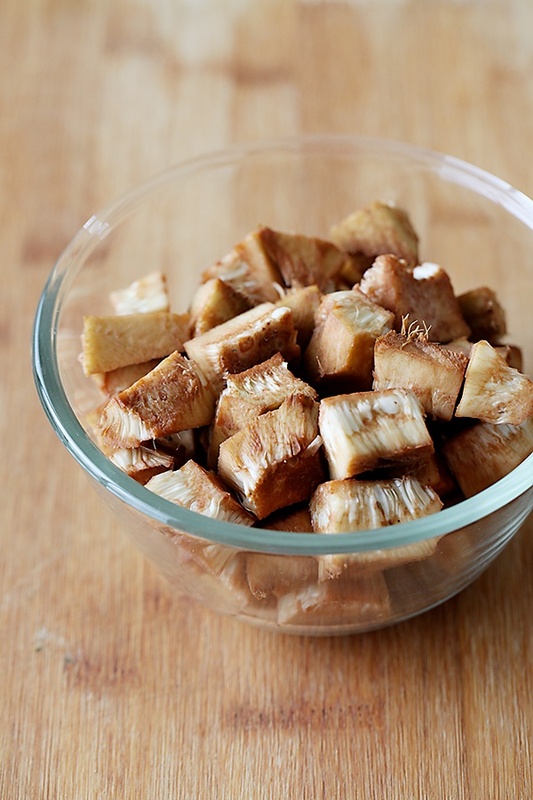 Did you use a raw Jackfruit? Wha do you mean by discard the center portion? nila- You can use tinned jackfruit if you want to try it with jackfruit. Or else substitute with other vegetables. Cauliflower, potatoes, broccoli and other vegetables will work fine! Bharat- Yes, I used raw jackfruit. 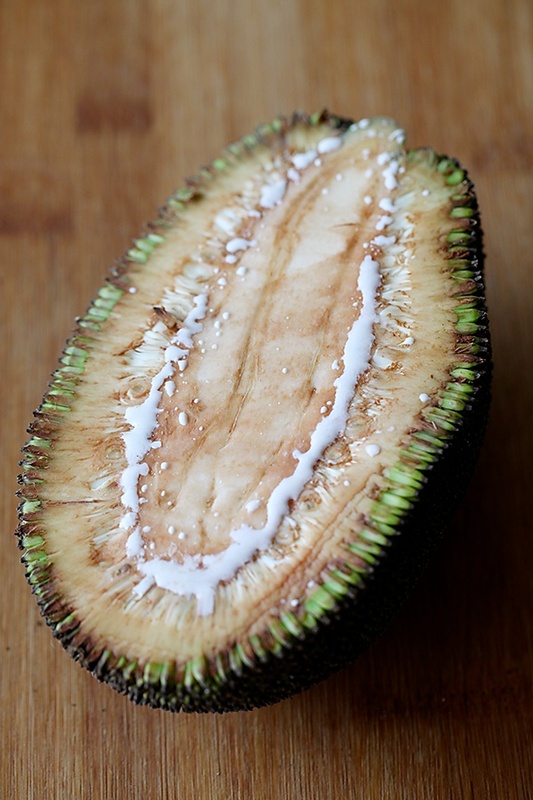 When you slit open a raw jackfruit, the centre portion that is woody needs to be discarded. This is different recipe for me to try. Thanks! Another version- pressure cook cut cubes along with few peanuts. In pan take oil(lot), asafetida powder, red chille powder, turmeric powder, godda masala (maharashtriyan brahmin masala). add cooked jackfruit and peanut. add Little tamerind juice, jaguary and salt. Very simple dish with spices enhancing jackfruit taste rather than over powering. Do try. I'm going to try this new version of yours. luckily in Chicago I get cut, raw but frozen:( jackfruit. Prajakta- Sounds delicious. Thanks for sharing!